It’s 1-1 as the NLCS heads to Los Angeles. 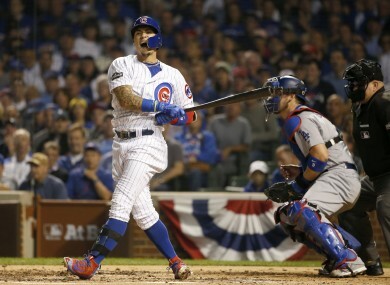 Javier Baez and the Cubs couldn't find a way past Kershaw on Sunday night. CLAYTON KERSHAW PITCHED seven stellar innings and Adrian Gonzalez hit the winning homer to give the Los Angeles Dodgers a 1-0 playoff victory over the Chicago Cubs. Kershaw allowed just two hits to help the Dodgers level the best-of-seven National League Championship Series at one game apiece. Gonzales belted a solo home run off Cubs starting pitcher Kyle Hendricks in the second inning, and thanks to Kershaw and closing pitcher Kenley Jansen it was enough. Kershaw gave up back-to-back Cubs hits in the fifth inning, when Javier Baez and Willson Contreras produced two-out singles, but not before he retired 14 straight batters. Kershaw struck out six in the dominant performance, and Jansen pitched a perfect eighth and ninth to secure the win. “It’s fun when you win,” Kershaw said, although he said that during the game the level of concentration required leaves little room for enjoyment. Jansen struck out four, including pinch hitter Miguel Montero, whose eighth-inning grand slam lifted Chicago to an 8-4 victory in game one on Saturday. Hendricks struck out five, walked four and threw 91 pitches before he was lifted in the sixth inning having surrendered three hits. That included the home run by Gonzalez. The series shifts to Los Angeles for game three on Tuesday, when the Dodgers give the ball to former Cub Rich Hill, while the Cubs send ace Jake Arrieta to the mound. Arietta threw a no-hitter at Dodger Stadium on 30 August 2015. The winner of the series will face either the Cleveland Indians or Toronto Blue Jays in the World Series. The Indians won two games at home to take a strong grip on the American League Championship Series, which shifts to Toronto for game three tonight. While the Cubs’ title drought stretching back to their last World Series triumph in 1908 is the longest in North American sport, the Indians have endured their own epic stretch of futility since last winning it all in 1948. Email “Nobody said it would be easy: Kershaw and the Dodgers shut out the Cubs”. Feedback on “Nobody said it would be easy: Kershaw and the Dodgers shut out the Cubs”.